I am a Diploma Qualified Clinical Hypnotherapist, Advanced BWRT ® level 1&2 l, EFT & NLP practitioner of over a decade's standing. I am also a General hypnotherapy standards council validated practitioner. This page shares some information about me, both my professional background and information about my personal profile. 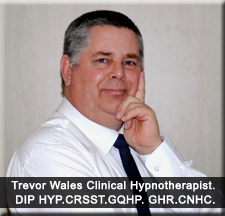 At Trevor Wales Hypnotherapy Solutions, I am very passionate about the cause of Cognitive mind based therapies and hypnotherapy in helping people to improve their quality of life. I understand how important it is for my clients peace of mind to know that they are in safe hands and dealing with a fully qualified, professional client centred therapist and success trainer and so prior to our first meeting I would like the opportunity to give you a little background about me and how I came to be a full time therapist. My background for most of my professional life has been dealing with people from all walks of life in a one to one consultation capacity finding personal solutions for my clients needs. In my career in personal specialist sales I also operated at both Management and Senior Management level. Additionally I became involved with health and safety at work and I my career direction took me into sales training where I trained teams of sales staff in selling skills, merchandising and technical product knowledge. I also wrote sales operation manuals for the organisations I worked with. I first developed an interest in Hypnotherapy in late 2004 early 2005 after using self-hypnosis to control and manage severe neck pain after a recent car accident. After directly experiencing the power of hypnosis to manage the severe pain I was experiencing I then realised just how it could be used on a diverse range of issues from resolving emotional issues, through to improving memory and learning, I decided that I wanted to help people improve their lives and I made the decision to study hypnotherapy with Chrysalis who are the UK's leading trainer in talking therapies. When I made the decision to train as a full time therapist I realised that many of my professional skills of taking on board new ideas and concepts and thinking in abstract ways coupled with my listening and communication skills and my friendly caring personality could be transferred into the world of therapy and so in 2005 I made a decision to train as a therapist. Since 2006 through the intervention of therapy I have been helping people to connect with their own best inner resources and help them to create succesful positive change in their lives helping clients with various personal and emotional issues and success related goals in both personal and professional arenas of life. My vocational training course was a one year diploma course in clinical hypnotherapy where I was required to submit twelve modules of written work of two thousand word essays and also practical work and case studies with an assessment exam at the end of the course. The foundation of the course that was taken through Chrysalis talking therapies who are one of the Uk's most highly respected training organisations for talking therapies. Since that time I have furthered my professional career through studies with the Essex Institute. 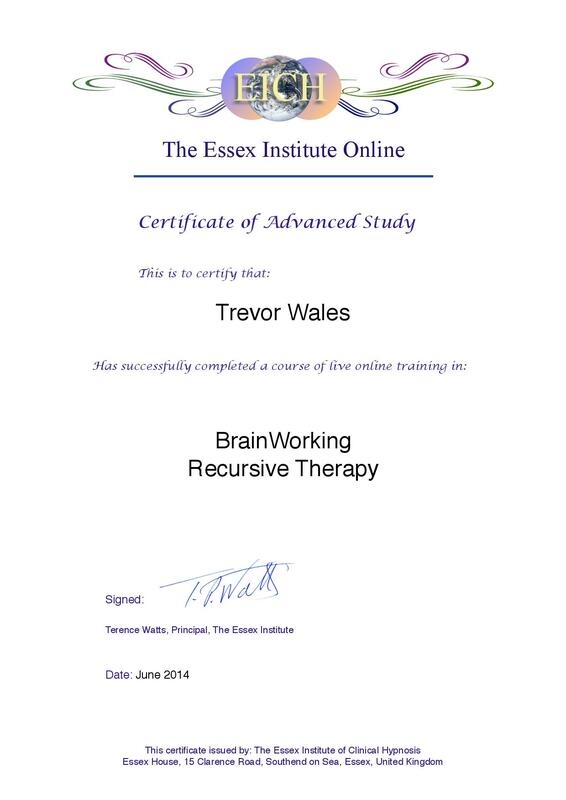 For those interested in the academic approach, my training was grounded WSN developed by Terence Watts of the Essex institute and in Eriksonian and Elman training. I mention these here as a point of reference for anyone who is interested in the subject of clinical hypnotherapy. You can find out more by visiting the really useful links page. I completed my course scoring mainly Straight A's and B+ for both my theoretical and practical work passing with Merit. I received my diploma in 2006 and since receiving my diploma I have further developed my skills through continuing on-going studies and practical hypnotherapy work, treating many varied issues such as fears and phobias, self-confidence, releasing guilt, releasing past hurt, insomnia, pain management, nightmares, weight management and stop smoking treatments. To ensure good competent professional and ethical practice,both Continued Professional Development and Supervision are a requirement of membership to the professional bodies that I am a member of and since 2005 I have continued to further my knowledge by taking part in regular monthly Continued Professional Development training plus specialist training courses beyond my current qualifications.I also have regular one to one supervisory meetings with my peer group supervisor where my skills and interventions with my clients are assessed and where I am also assessed relative to my own health and wellness and fitness to treat clients. Why is it important that a therapist has supervision? It is very important that the practitioner you choose has regular supervision from a peer group supervisor to ensure that their own boundaries are established and in place as far as workload is concerned and that they are ensuring they are meeting their own health and wellness needs so that they are in a fit state of mind to be able to help you the client.In my opinion this is a question that every potential client should ask as it gives you a vitally important place to start in having peace of mind and a comfort level that you are dealing with a professional who takes all aspects of health and wellness into consideration including their own. 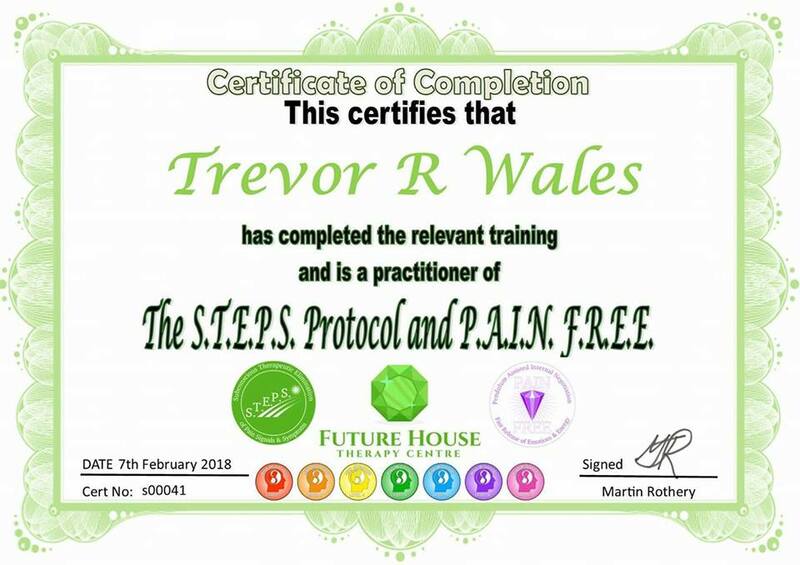 Why choose Trevor Wales for my therapy treatment? Here at Trevor Wales Hypnotherapy Solutions the focus is not only on helping you to feel much better quickly or helping you to be the best that you can be, but in finding out what it is that is causing the problem for you and freeing you from it, letting the past go, or in the case of improving personal performance helping you to believe in your abilities to overcome the challenges that hold you back from achieving your goals. This can sometimes be experiences, beliefs or old habits that are buried deeply within your psyche. Hypnosis and positive suggestion come together to help you to deal with your challenge by creating positive, transformative solution based outcomes, by encouraging you to think in a more positive and self empowering way through the use of hypnosis and positive suggestions. My Qualifications and professional bodies. I have held a diploma in hypnotherapy since 2006 achieved whilst studying clinical hypnotherapy with Chrysalis who are the UK's leading trainer in talking therapies. 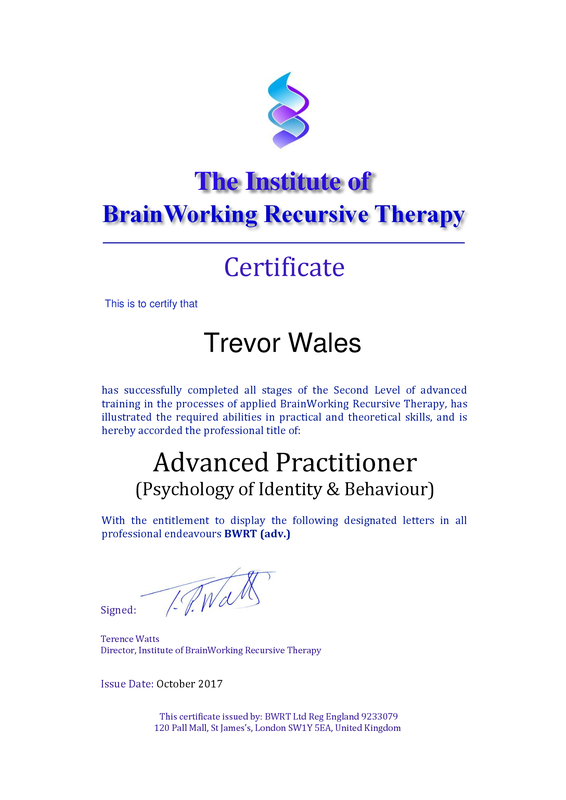 I also hold an advanced practitioners certificate of level 1 BWRT® www.bwrt.org BWRT ® is new cuttiong edge form of psychotherapy therapy and there is really nothing else like this remarkeable therapy for achieving the rapid results that it does. 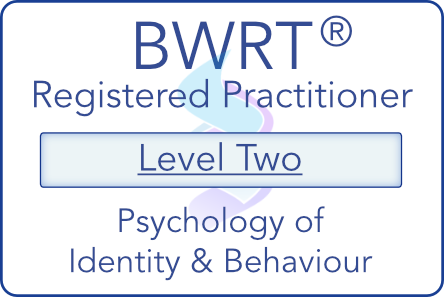 BWRT® is becoming very much more central to my therapy practice. 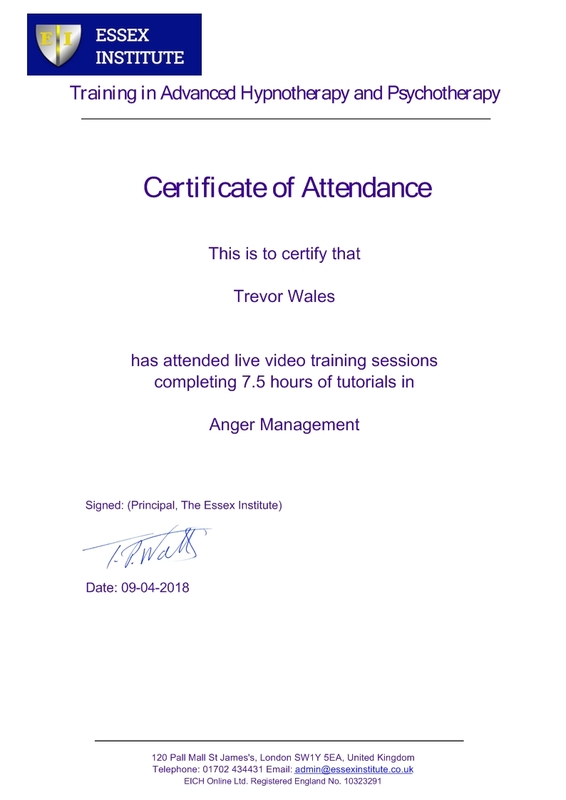 BWRT® was developed by Terence Watts of the Essex Institute of Clinical Hypnotherapy with whom I have a very close association because of the excellence of the institutes teaching standards. Since receiving my diploma I continually further develop both my practical and theoretical skills with regular workshops and further on-going studies and practical work. As a member of the General Hypnotherapy Register and CNHC I am required to abide by both bodies' stringent code of ethics. These bodies exist to ensure you, the customer that high levels of professional standards are delivered by the therapist in the most professional way. Both Continued Professional Development and Supervision are a requirement of membership to the professional bodies that I am a member of and I continue to further my knowledge by taking part in regular monthly Continued Professional Development training and specialist training courses beyond my current qualifications. You can be confident that because of the quality and thoroughness of my training that you will be receiving the highest level of professional clinical Hypnotherapy coupled with excellent customer service. I am very sociable, warm friendly and outgoing with a calm disposition and I love to talk to people and make new friends. I am a quietly confident person; who is neither showy, pushy nor flamboyant. I consider myself to be a kind person of good integrity with strong moral ethics. I am also a very spiritual and open minded person. I love the countryside and coastline and I also love to paint and I enjoy a wide variety of music. I believe music and art to be a very essential part of mankind’s spiritual experience and I believe they are very therapeutic tools in the pursuit of well-being and personal happiness. Like most people who experience challenges and issues in their lives that can be difficult to face up to whether it be through difficult emotional family issues, unemployment and confidence issues, relationship issues, I believe my own personal life experiences have equipped me with an empathic insight and sensitivity to help others who need help to change their own lives for the better. I recognize that each and every human being is a completely unique individual with their own personal story to tell and on their own personal spiritual inner and outer journey. 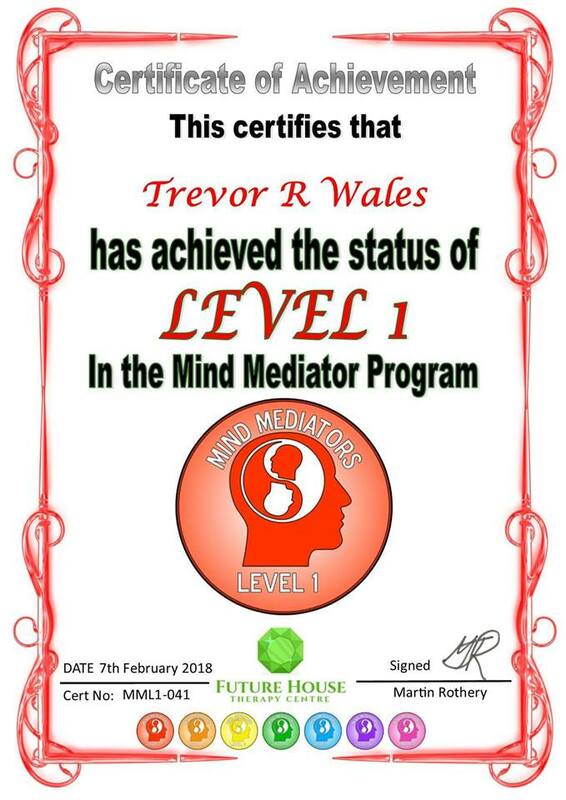 I am passionate about cognitive mind based therapies and how they can improve people quality of life and I really enjoy helping people to overcome life’s challenges, and help them achieve their own true potential in life. I look forward to helping you too. I am a member of the following. As a member and registrant of the GHR and CNC I am required to work to those bodies professional standards designed to protect the public and ensure good ethical professional standards of care and client confidentiality. It is also a condition of membership to have full public liability insurance.Membership of a professional body and being covered by public liability insurance are criteria which I believe should be a very important consideration for anyone thinking about choosing a therapist, as to belong to a professional body one has to prove that not only are they professionally trained and qualified but that they are also engaged in regular continual professional development training and supervision. This is especially so in the case of the CNHC as it was set up with government support to protect the public by providing a UK voluntary register of accredited complementary therapists. As it stands in the UK currently there is absolutely no official government legislation put in place to ensure that any therapist is properly trained and regulated by a governing body. Anyone can call themselves a therapist and practice without training and regulation and supervision assessments. Without doubt any caring therapist who cares about their clients and their professional reputation will have trained by a recognised training body or school and will belong to a professional body such as the GHR or HA and will be continuing to study best practice and take regular supervision ensuring they are up to date with their knowledge and that they are also fit to be effective for their clients. Membership of these bodies and my professional insurance cover are benchmark standards put in place to assure my clients of my professional standing in my field of therapy work and my commitment to excellence in carrying out therapy to help clients achieve their goals and find solutions to their problems and in client welfare and duty of care.